Boeing is researching a new midsize aeroplane (NMA) concept, dubbed the 797. According to Jon Ostrower, it’ll be a smaller, twin-isle aircraft. It’s a welcome annoucement, to an extent. While I like the 737 design for nostalgic reasons, neither it or the A320 are really replacements for the sleek plane Boeing no longer makes for this market segment: the single-isle 757. The 737-900ER and the A321 could be replacements for the aging 757 fleet. They were more efficient airplanes and they had commonality with the rest of the narrowbody fleet. It was perfect. The 757s started to disappear on domestic routes that could easily be served by these other airplanes. But the 757 is a special airplane that has a lot of fantastic capabilities. While it could be replaced on most domestic routes, it couldn’t be replaced everywhere. See, the 757 can carry a full load a long way. That made it perfect for longer routes that didn’t have the demand for a widebody like the 767. The 757 is maybe the most versatile jetliner Boeing has ever built — a medium-capacity, high-performing plane that is able to turn a profit on both short and longer-haul routes — domestic or international; across the Mississippi or across the North Atlantic. With 180 passengers, the  can safely depart from a short runway, climb directly to cruise altitude, and fly clear across the country — or the ocean. Nothing else can do that. And, it’s a good-looking machine to boot. Muscular yet graceful. I’d agree. The cockpit windows that look so weird on the 767, and downright silly on the 777, look sleeker on the 757. And whereas the 757 looked more modern than the 727 it was designed to replace, you can’t say the same about the 737-MAX, or the utilitarian A320neo. 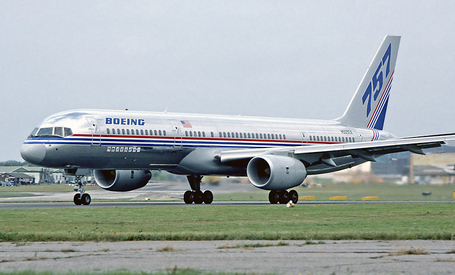 A revised Boeing 757 airframe, dubbed the 757-8, for consistency with the 787 and the 747-8. The 757/767/777 cockpit windows have been proposed for the 797 anyway, so they’re halfway there. Chevron engine nacelles of the 787, 747-8 and 737-MAX, in part for noise reduction, and also because they look cool. A large commission cheque I’d gladly share with the commentators above.